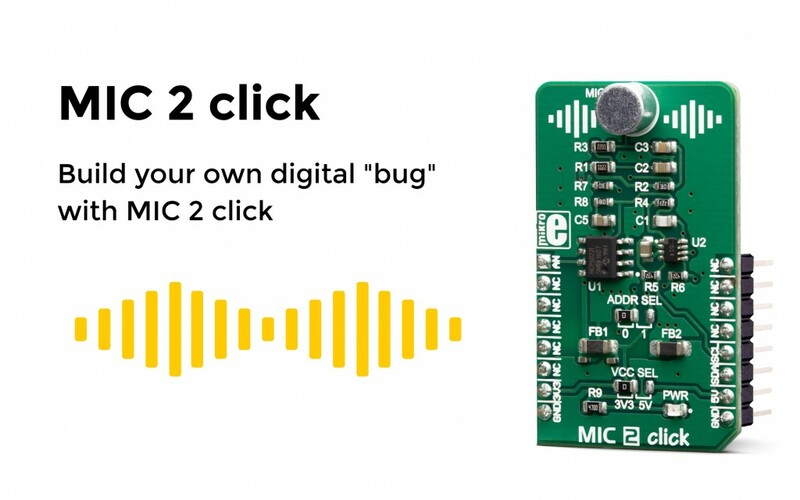 MIC 2 click is a small electret microphone on a Click board™, facilitated by a small pre-amp with digitally controllable gain. A gain ratio can be controlled over the I2C interface in 64 discrete steps. Once you are happy with the gain factor of the pre-amp, it is possible to lock-down the position of the digital potentiometer, so the gain ratio will be retained between power cycles. The pre-amp output is fed to a mikroBUS™, enabling the host MCU to digitize its input. The Click board™ features a high-quality omnidirectional electret microphone. Typically for such microphones, it has a very low output signal, in a magnitude of just a few mV. Therefore, its output has to be properly amplified to reach the line level voltage (approximately 0.3 Vpp - 2 Vpp). To achieve this, there is a programmable potentiometer, connected in the feedback loop of the operational amplifier, allowing the MCU to set the desired gain ratio. When the signal is properly gained, the host MCU can digitize it and apply any type of digital signal processing to it.